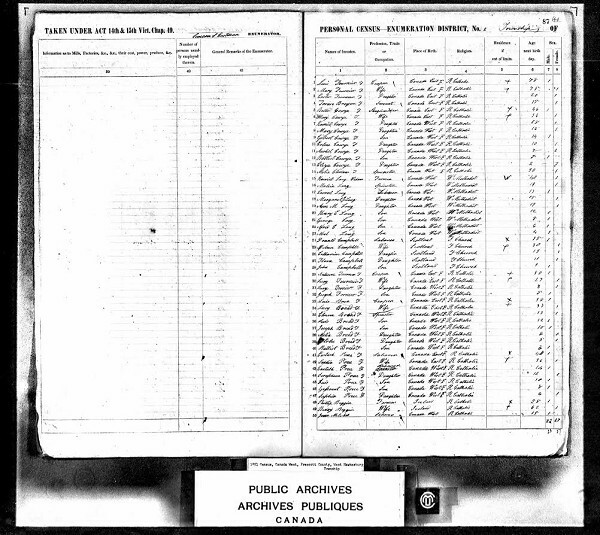 Canadian census of 1851shows the Fournier family and the later famous son Fabian Joseph. A rare genealogy find with a Bay City connection from 166 years ago turned up this week. I know, I know, Paul Bunyan is a hackneyed old story from bygone days that nobody cares about anymore. However, that opinion was disproven by the estimated 400 in attendance at my Paul Bunyan presentation at a folklore festival at Macomb Community College in Clinton Township this past Wednesday. In the crowd was a dedicated genealogist who since has found the family of Fabian Joe Fournier in the Canadian census from 1851. The identification of Bay City's own tough guy, Fabian Joe Fournier, as the woods giant of legend was the heart of my talk. Afterward, a gentleman approached who said he was of French Canadian heritage and believed he could find Fournier's parents and family in the Canadian census records. His name was Ted Held of Grosse Pointe. And so he did, e-mailing me a copy of the census listing Antoine Fournier, 30, a cooper (barrel maker), Lucy Fournier, 27, daughter 8-year-old Lucy and son 5-year-old F. Joseph Fournier. It was him! The same fabled fighting Fournier killed on the Water Street ferry boat dock in Bay City the night of Nov 7, 1876. The date of his birth, 1846, lines up with the fact that Harry B. Smith, a local lumbering aficionado who found Fournier's tintype and gave it to me had figured his age as about 18 when he arrived here in 1865. It was the murder of the double-jawed brawler that propelled him into the history books, movies, fantasy tales, and operetta. And literally hundreds of statues in towns all over America that falsely claim him despite the fact that we know for certain he was a Bay City brawler in the best tradition of Hell's Half Mile. Bay City history buffs all know the story so I won't repeat it here except briefly to note that it was the Saginaw Daily Courier that covered the story and the subsequent trial of the accused killer, Blinky Robertson, a stone mason. We needn't say more than the long-standing rumor that the jury's prejudice against Fournier mainly because of his violent past caused them to free the obviously guilty Robertson. Justice was not done then, but we have endeavored to give Fournier his due these past 25 years with a book snatching him from Disney fantasyland and solidifying his credentials as a real lumberjack. The Paul Bunyan legend had been talked of in lumber camps for years, and the oral tradition took on a larger folklore persona gradually after the first mention of him in print, in the Oscoda Press of August 10, 1906, under the pen of James T. MacGillivray, an Ontario-born lad whose family moved to Oscoda when he was 16. MacGillivray said he heard the first Bunyan stories as a cook's helper in Rory Frazer's logging camp 22 miles east of Grayling, (near Luzerne) an area where the brawling Canadian giant Fabian Joe Fournier had worked about 25 years earlier. 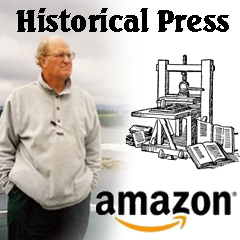 MacGillivray became a newspaper writer in California, Washington, and Alaska, where he also worked in lumbering and mining. In MacGillivray's imagination, Paul Bunyan and Fabian Joe Fournier stories merged and hit print. The first story -- a fanciful one with exaggeration its main element -- was entitled "Round River." It told of a logging team that had cut a hundred million board feet off one forty-acre parcel of woods. It spun the improbable tale of "Double-jawed Phalen" sleepwalking one night and chewing up the only grindstone in camp. The lumberjacks then would take big stones from the riverbed and start them rolling from the top of the hill, holding their axes to them as the stone rolled downhill. Double-jawed Phalen, of course, was an allusion to Fabian Saginaw Joe Fournier, who allegedly had a double row of teeth. Fourty Four Jones, the straw boss in the story, saw a herd of deer coming down to drink in the river and loosed a load of logs waiting at the banking ground for the spring drive. "He starts the logs down that shoot and kills more'n two hundred of them.? The lumberjacks had venison steak all winter, which went fine with the pea soup ? made when a wagonload of peas was dumped into the hot springs. That was a reference to Iargo Springs near Tawas, hot springs that are a tourist attraction today. Here's the part in the story where Paul Bunyan springs to life: "Canada Bill he says to Bunyan, "It's all right, Paul, them is hot springs." This is the first written mention of Paul Bunyan, who was a character of lumbering legend supposedly mentioned around campfires when the discussion turned to feats of strength or endurance. The name Bunyan may have come from the Canadian "Bon Jean," a huge fighter in the Papineau Rebellion of 1837. Nobody knows where the Paul originated, although it was a common French first name and may have been attached to complete the persona of the giant, mythical figure. In 1910 MacGillivray had moved to the Detroit News- Tribune when a fateful meeting of the staff under City Editor Malcolm Bingay occurred. It was a dull Saturday with little breaking news for Sunday"s paper, so Bingay asked his staff: "Write your own good story for the Sunday magazine." MacGillivray then re-wrote his 1906 story from the Oscoda Press, "Round River," and enhanced it with a new title "The Round River Drive." An artist drew a campfire scene with lumberjacks telling stories to go with the article that ran in the News-Tribune illustrated section on July 24, 1910. The fact that the tale appeared in a Detroit newspaper gave the Paul Bunyan legend more credibility and exposed it to many more readers than the tiny weekly Oscoda Press in a remote lumbering town 200 miles away. Another indication of the story's spreading interest was the publication in 1914 of a poem in American Lumberman trade magazine. Noted poet Douglas Malloch collaborated with MacGillivray on the poem. Two books came out in 1924-1925, written by James Stevens, the lumberjack author from Seattle, and a children's book by Esther Shephard, folklore specialist, illustrated by Rockwell Kent. Stevens' book postulated the connection between Bon Jean of the Papineau Rebellion of 1837 in Canada and Paul Bunyan. The legend was off and running, with hundreds of books, articles, statues, even a Disney movie and the Paul Bunyan Operetta. My wife Dolores and I were privileged to be hosted by Opera Omaha, and the Omaha, Nebraska, Library System for the premiere of the operetta in Omaha in 2005. A chapter in the book was excerpted in a nationally-circulated middle school language arts textbook and electronic text and audio supplementary materials by DMC Paradigm Publishing in 2007.